Defiant Russia's first edition immediately hit a sweet spot with gamers. We packaged it in a small box and gave it a small price, and leveraged the distribution network we’d expanded during the d20 role-playing gold rush to sell an enormous number of them (enormous relative to the specialty game industry, anyway). The game played really well and its popularity quickly took off. I’m pretty sure we sold more traditional wargames than any other publisher that year; it was a brief and glorious moment. And we then proceeded to crash back to Earth even faster. Those days are long gone, but Defiant Russia is back. It’s a different Defiant Russia. Bigger, with more stuff. More scenarios. More map. More pieces. If you never played or saw the first edition, you’re in for some real fun anyway. 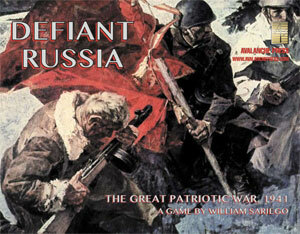 Defiant Russia is a fast-playing game built around the immortal principle of “roll a six, get a hit.” The first edition covered Operation Barbarossa, the Axis sneak attack on the Soviet Union in June 1941, veering the first seven months of the war. The new version has all that, plus more. In the midst of preparing Defiant Russia for a reprint, I went to visit our local printer to pick up some things we needed right away and ran into their forewoman. She wanted to show me their brand-new press, a new piece of technology that can do short-run items (small numbers) but can handle large press sheets. That changed things for Defiant Russia. I immediately cancelled the artwork then under way for a 22x17-inch map on two panels. We moved to 22x28 inches, on one sheet. Guy Riessen’s new and larger map allowed extra stuff to go into the game box that I’d planned and prepared as part of the marketing campaign for Defiant Russia (via the Gold Club’s Golden Journal). They would have required add-on maps to provide extra territory on the edges of the map, and that would have been pretty cool, but it’s much better to have those areas right there on the game map. The map now reaches from Berlin on the west/left to Kuibyshev/Samara (on the middle Volga) on the east/right, and from Petrozavodsk on the north/top down to Kars on the south/bottom. So the new game includes an introductory scenario (yes, and introductory scenario to an introductory game) called Defiant Poland. That covers the 1939 Polish Campaign, with the Poles fighting a brave but doomed struggle in a very short scenario that gives players a quick look at the game system. And it also includes the Defiant Turkey option, also originally intended for the Golden Journal. This is one I wanted to publish from the first moment we brought out Defiant Russia, but it required a map extension for the Caucasus, and we didn’t really have the ability to make little add-on maps and the means deliver them. An add-on map was just too complicated for a Daily Content download, and by the time we had the Gold Club and its Golden Journal, Defiant Russia had been out of print for years. Many years ago, I believe I was still in junior high school, I played the ancient Avalon Hill Russian Campaign game and decided to write a variant for it, adding the Caucasus and Turkish units. I sent in my hand-drawn map and typed up variant to the Avalon Hill General magazine, then the bible for wargamers. And some weeks later, I got a reply in a crisp white envelope with the black-and-red Avalon Hill logo in the upper left corner. Inside was a letter informing me that the editor had no interest in “Martian Intervention in Russian Campaign,” and it went on to critique my map drawing skills, my typing skills, and my failure to include a self-addressed stamped envelope (this being the Time Before The Internet). That letter contained as much bile as could be stuffed onto a single sheet of Avalon Hill stationary. And then the editor went on to ridicule “Martian Intervention” in the next issue of the magazine. That was pretty hurtful to my 12-year-old self. So anyway, in honor of that buffoon, Defiant Russia now includes an option for Turkish intervention, with Turkish units plus the Soviet ones that garrisoned the Caucasus. It’s not as much of a game-changer if invoked, since the Caucasus is pretty defensible terrain and the Turkish Army has no armored forces at this scale, but it does stretch the Red Army just when it really doesn’t need to be stretched. Having the possibility exist, even though it’s a very small possibility, does something else I like in games: it forces the Soviet player to make a decision regarding the forces to keep in the Caucasus. He or she can weigh the risk and then decide to strip the garrison or leave it intact, rather than keep those units down in the bottom right corner of the map because Rule 13.5 commands it be so. Stalin and the STAVKA had to make that decision, so why should it be denied to the player? The much larger game-changer was inserted by designer William Sariego, who has made the opening turn much more destructive for the Soviet Union. There’s exploitation movement and exploitation combat and some extra German firepower, all assuring more Red Army losses (well, if the dice roll as they should and the Axis player plans the attacks well). The Red Army can strike back, so if the Axis is too careful someone’s going to suffer serious losses anyway. The orders of battle have been adjusted for both sides; there are more (but weaker) Romanians, another Finn, and some minor shifts in German and Soviet unit strength. And you can take the game deeper into the war, with more scenarios covering a broader stretch of time. We ran a lot of Daily Content for the first edition of Defiant Russia, and the best of those are now part of the game as well: the Lithuanian option, workers' militia, German parartroopers, Rommel on the Steppe and many more. Playing this game is going to be more fun than eating bacon.